I would like to say a massive thank you to Peter Edwards. 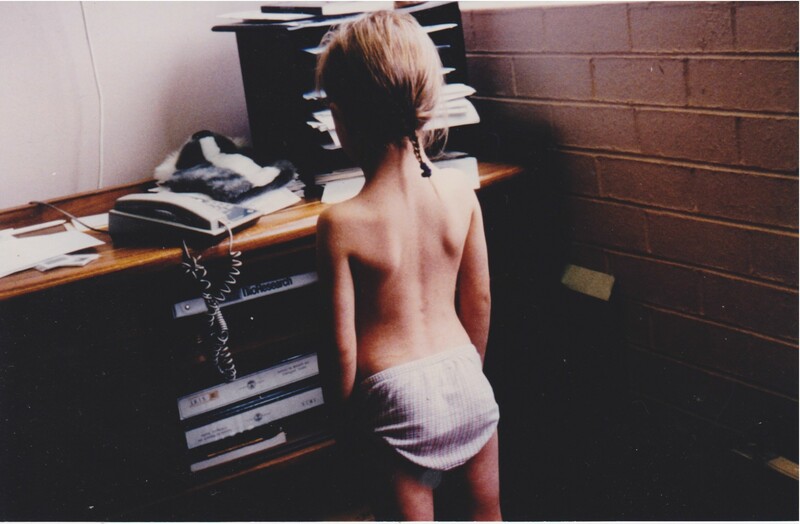 My son Hendrix who was 11 months at the time had been suffering severe eczema most of his life. It was so bad that at times it would look like a crime scene in his cot from him scratching it so badly. We were at our wits end feeling so helpless after numerous doctor visits and trying every cream and medicine under the sun! My Mum recommended Peter as she had taken my sister to him years earlier. Within 3 days of our visit to Peter my sons eczema started to clear it was unbelievable. Not only that but in the month since then has whole personality has changed. Hendrix is happier, playing better and calmer. I can not thank Peter enough for helping our little Hendrix and will continue to recommend him to everyone. Photos taken just 4 months apart. Minimum supplements needed once the cause is correctly identified and removed. Education not just medication! My daughter’s Chronic Skin Problem – Now no longer a problem! 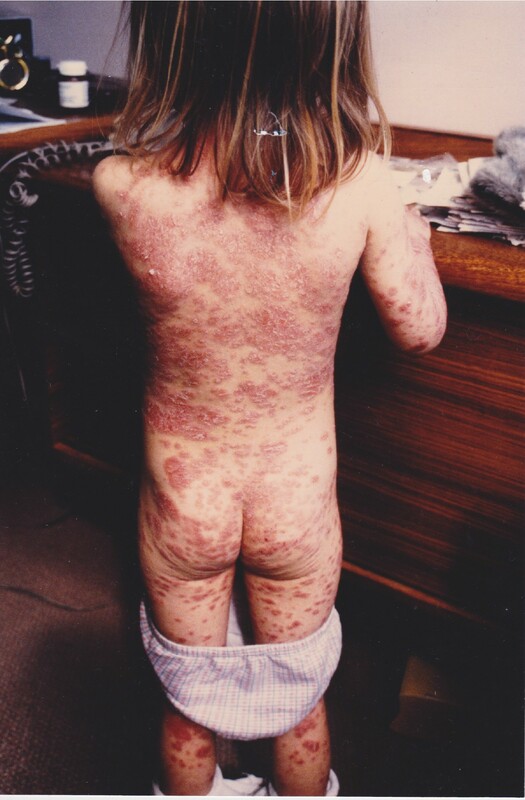 During the years when my daughter was aged 8 and 9 she suffered from reoccurring skin lesions. Sometimes the lesions would present as pimples and would heal quickly. Other times they would initially present as a pimple and would then deepen, breakdown and eventually bleed. I considered her condition chronic. During this time we consulted two skin specialists, GP’s, GP’s with an interest in holistic medicine, a homeopath, an allergist and naturopaths. After each consultation we followed the prescribed treatment course precisely. I didn’t feel that anyone was getting close to addressing whatever the problem was and the lesions kept returning. In passing, a friend who had no knowledge of our daughter’s situation, mentioned that she had an ongoing health problem that her GP was unable to treat and that she had seen a naturopath who had provided her with a solution. She mentioned Peter Edwards’ name. Before I even met Peter, I was impressed. His qualifications are extensive and I was reassured by his years of practising experience. I made an appointment for my daughter to see Peter. After some discussion and examination of my daughter’s eyes, Peter made a diagnosis. He suggested diet change and only two natural supplements. We adopted his treatment course and from that day to the current time, a period of 9 months my daughter has not had any lesions. We have had one exception to this which was after a family holiday when we let Peter’s dietary recommendations slip. Peter relates beautifully with children, gaining their trust immediately. He is caring, compassionate and gentle. Today, at almost 11 years of age, my daughter’s general health has improved as has her enthusiasm, appetite and confidence. I attribute this wonderful change to Peter and the treatment plan he devised for my daughter and we are deeply thankful. We see such a lot of children with skin problems these days. Why? Mainly because they are not digesting certain foods, or are being fed the wrong types of foods, on a regular basis. This food ferments, causing acidic waste that often irritate the skin as it passes out via this organ of elimination. The skin is the largest organ of elimination of the body. We shed almost 60 kilograms of skin in a lifetime and much more than this if you skin brush, as I recommend. ￼As I suggest to my students, if you collect the skin that comes from your body as you give yourself a good skin brush and have it analysed, you will see that it is made up of much the same chemical elements as is your urine, except for the water. This reveals the fact that we literally eliminate acidic waste products through our skin. This is why body odour can be sometimes offensive. This also explains why our skin can become irritated, inflamed and even degenerative. She took Lara to a general practitioner in April after she developed a rash on her face and head. 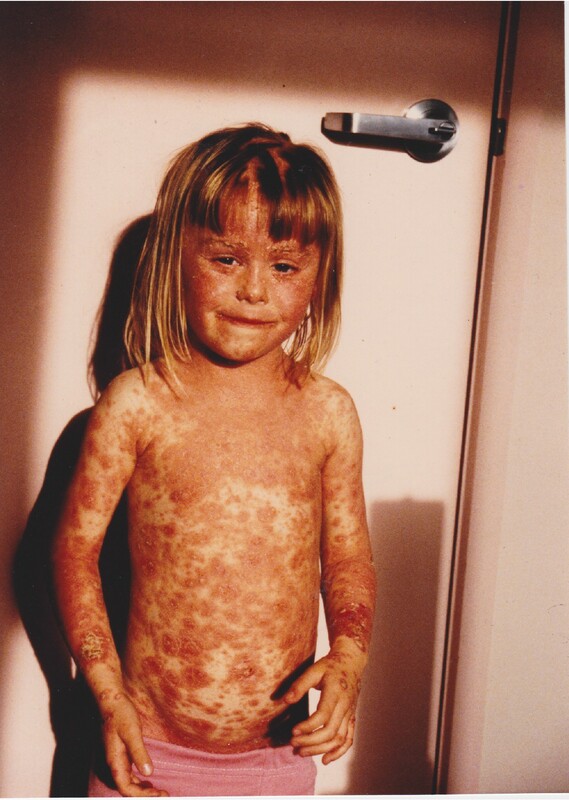 The doctor described the illness as a heat rash, and when Mrs Smith sought a second opinion from another GP it was diagnosed as severe chicken pox. 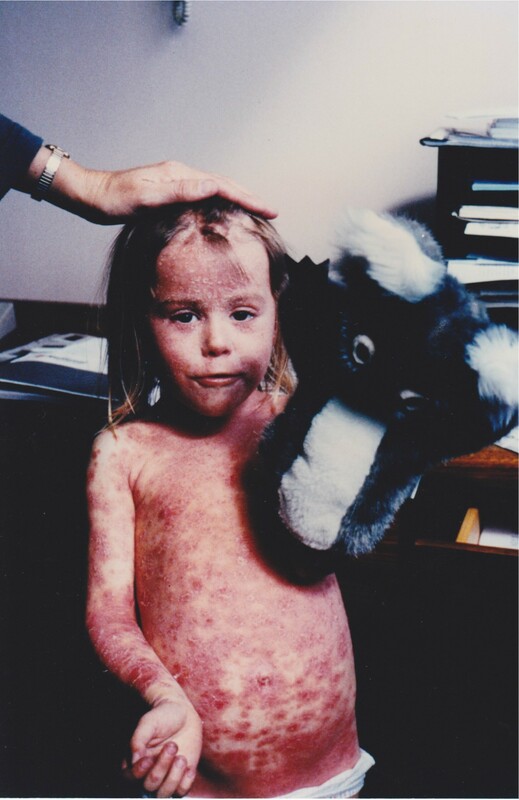 The rash kept spreading, so on May 8 she took her daughter to a dermatologist who diagnosed the condition as the skin disorder psoriasis, which causes scabby, flaky skin. At the end of June Lara was covered in a rash. Some sections of her skin appeared to be burned and damaged and her hair was falling out. Desperation led her to seek another solution. “We had good reports about naturopaths and by this stage I was in tears every day,” said Mrs Smith. 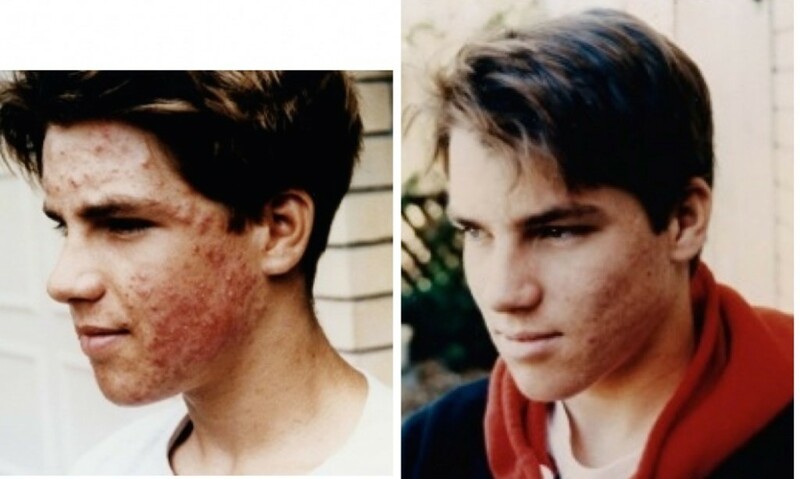 Naturopath Peter Edwards decided the problem was caused by an acid build-up in the girl’s body, which was working through the skin and actually burning it. “She had a digestive problem which was causing a backlog of metabolic waste that had putrefied and caused acidosis, and that was coming out via the skin,” said Mr Edwards. He put Lara on a regime to cleanse her system, which included cutting all dairy products, wheat and sugars from her diet, and giving her natural anti-inflammatory vitamins, minerals and amino acids. After the condition initially worsened, it improved significantly within two months and took another two months to clear. Australasian College of Dermatologists honorary secretary, Dr David Wong, said psoriasis usually did not disappear overnight. With treatment by a dermatologist, skin usually calmed down after four to six weeks and lesions disappear within two to three months. “It could take six months for 90 percent lesions to disappear,” he said. What I do feel about naturopathy is if you want, find out for yourself and see if it helps,” said Dr Wong. “If it doesn’t help, come back. I’ve had patients come back where naturopathy hasn’t helped them. Lara first visited my health centre in June. 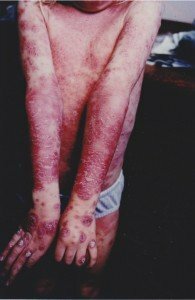 She has been diagnosed by a dermatologist as having severe psoriasis. The treatment offered little help so Lara’s parents decided to try a naturopath. Once I saw her, it was clear to see that she had a digestive problem. In the photo you will notice the bloated abdomen. This was caused by fermentation in her digestive tract of certain foods she was eating regularly. The fermented material caused acidic waste products to build up in her body and the skin (known as “the third kidney” and the largest organ of elimination of the body) was being used to eliminate the high amounts of acids. Her skin was actually being burned by these acidic wastes, leaving her body via the skin. It sounds simple doesn’t it? Well, in most cases it is but not all. I would like to bring out the significance of the role of Lara’s parents in this case. Without their full co-operation this success story would not have been the same. The best physician children will ever have is their parents. These parents could have easily chosen to go back on strong drugs in an attempt to reduce the suffering of their little girl. But they did not; they persisted and followed everything I asked, to the letter. As I have shared in many other case histories, the condition can get worse before it gets better and this is what happened here. The skin did actually get more angry and inflamed. As the accumulated acidic wastes in the little girl’s blood and tissue began to move and come out of her body, the skin became more aggressive. As she passed urine, it would sting and burn because of the toxic waste leaving her body. The parents and I worked very closely together to begin with. I saw her regularly and had phone contact at one stage every day. I had to reassure these loving parents that what was happening was a positive sign that indicated the body was removing the chemical cause of her condition. I analysed thoroughly what I was doing with this little girl and reassured myself that this was indeed part of the healing process. Who wants to put a child through suffering like this unnecessarily? Not me. ￼I fully reassured the parents we were on the way to recovery. They just had to be patient and continue to work with me, and they did. We all persisted. Lara was the perfect patient, too. She and I became best friends. It wasn’t long before Lara’s mother phoned with the good news that Lara was looking and feeling better. From here she got better and better as the parents were careful in following the advice I had given. Now what do we have? A beautiful little girl, even more beautiful than before she developed the skin problem. I would like to share another interesting story about another special little lady named Laura. The letter below is from her mum Susan. 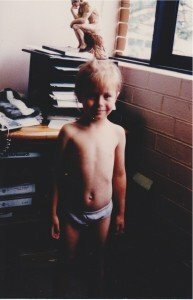 Laura was a very healthy baby and toddler and I had continued to breast-feed her until just before her third birthday. However, soon after I started to gradually wean her she developed an eczema rash on the insides of her elbows and behind the knees. The rash progressively got worse over the next year and a half. My husband and I consulted various practitioners, including medical doctors, homoeopaths and five different naturopaths without any success. Laura was given dozens of different topical lotions and creams, numerous herbal tonics and supplements, but none of them seemed to work. Doctors would only prescribe a cortisone cream, which I was reluctant to use for a long period of time, as we had always believed in getting to the source of the problem rather than treating the symptoms. At times her skin would slightly improve, but when it returned it would be worse than before. When Laura was 4 and a half, the rash was so bad that it covered most of her body. The itching at night was so intense that she would scratch in her sleep all night and in the mornings the sheets would be covered in blood. Her skin was very hot to touch, as though it was burning up from the inside. In an effort to stop her scratching, I would sometimes have to bandage her arms and put gloves on her hands, but she always managed to break free of them during the night. Luckily, my mother had seen an article in her local paper about Peter Edwards’ success with another little girl called Lara and she gave me the cutting and suggested I call him. Even though it was an hour and a half drive away for us, we made an appointment with Peter. Peter diagnosed Laura’s problem as toxaemia, as she had a digestive deficiency in the gut, which was causing the problems. She also had food intolerances, which were causing metabolic waste to be excreted through her skin. Peter advised that we carry out some major changes to Laura’s diet by removing all sugars, dairy, wheat and gluten. He also gave her some supplements and a vitamin tonic to assist the healing process. Within just one month her condition had improved and her skin was cooler to touch and the itching was starting to ease. After 3 months, her condition had improved significantly. We continued her on the diet and supplements for another year and she became used to not eating the same foods as her friends at preschool. Laura knew that when she broke the diet her rash would flare up again, so she was very disciplined and would refuse chocolate and lollies if offered at a party. Today, Laura is a bright and gifted child who excels in everything she does. She loves playing piano, singing, ballet and going to school. She has no restrictions to her diet now, however she still prefers to eat healthy food anyway and doesn’t like junk food. Occasionally she will have a minor flare up as sometimes chlorine in pools can aggravate her skin. She has a very strong constitution and has never been on any antibiotics, Panadol or any other drugs in her 6 years. Given the excellent advice from Peter, Laura’s rash is able to be managed naturally. This is an interesting story. The little girl recovered, however, and I have to add her parents were also the key here. They followed my instructions to the letter. They were of the attitude of: ”We’ve tried everything; this is our last resort”. I hear this often. I would like to bring out that this little girl is indeed gifted. She has a very keen mind and has a great ability to concentrate. The changes to her diet and removing the offending foods has done more than clear her skin; it has helped to clear her mind. This is just one example from hundreds revealing the same results. When the diet was improved or corrected, the results are seen in the life of the child (and adult) on all levels.